Yesterday, Judi.0044 asked me about whether and when you can substitute shortening for butter in baked goods. I have a lot of experience in this area with cookies, and some with cakes, so I’m happy to pass along what I know. In general, you can substitute shortening for butter in equal amounts in baking recipes (not the frosting or icing, though—yuck). Shortening yields higher, lighter-textured baked goods, which is sometimes preferable to butter (depending on what you’re making). Butter naturally has some water in it; shortening doesn’t. Cookies made with shortening and no extra water added, for example, are higher and lighter, while butter cookies are flatter and crispier. This is because butter has a lower melting point than shortening, causing them to spread faster and more in the short time it takes to bake a cookie. If you use shortening, but want an effect closer to butter, add 1 and 1/2 teaspoons water for every 1/4 cup of shortening. But, of course, the elephant in the room here is flavor, or more precisely, lack of it, in shortening. If butter plays a central role in the flavor of a cookie or cake (e.g., shortbread cookies or butter pound cake), the end result will be diminished unless you radically alter the flavor profile (e.g., flavorful extracts, spices, glazes, etc). If you’ve eschewed shortening altogether in recent years, you may be pleased to know that the major brand, Crisco, now makes all of their regular shortening without trans fats. Hurrah! They started making a separate variety of trans-fat free shortening two or three years ago, but I’m assuming they realized that no one wants trans fats so the switch was made. Spectrum Organics also makes a trans-fat free, organic shortening. Just a few years ago, I could only find the Spectrum brand at my natural foods co-op, but now it’s sold in my regular supermarket. Three cheers for healthy progress! As an experiment, and an excuse to procrastinate from my recipe testing, exam grading, and general housekeeping, I decided to make a batch of cookies I developed for my Enlightened Chocolate book (I also needed to do some advance baking/freezing for a reception this Sunday, so now I have a leg up on one of my to-dos. Welcome to my wacky world of rationalization). I called for butter in my original recipe, but I was curious to compare with shortening. For the record, I used unsalted Land O’ Lakes butter and Crisco plain shortening sticks for the testing. The photo above shows the cookies: the shortening cookies are at left, the butter cookies at right (note: I had to use a bit of Dutch process in the shortening cookies, which is why they are darker). As much as I love these cookies made with butter, I was surprised to find I preferred the texture of the shortening cookies—lighter, crispier exterior, greater puff, and a pleasantly chewy center. The butter cookies were flatter, crispier around the perimeter and far more chewy overall, reminiscent of a fudgie brownie. Taking side by side nibbles of the two test subjects, I could definitely discern the absence of butter in the shortening cookies, though. The butter coaxes out the subtle flavors of the vanilla and the bitter, earthy notes of the cocoa. That being said, I don’t think I would notice (or, perhaps, care) if the shortening cookies were my only choice; they were still darn good. I’m thinking I may have to try a combo of butter and shortening. I’ll keep you posted. Hmm, this makes three dessert postings in a row. Am I revealing too much of my raging Mr. Hyde-like sweet tooth? I’ll switch back to Jekyll mode in the days and posts to come. I have an incredibly easy and delicious fish technique, in particular, I’ve been meaning to share for awhile now, so look for that next. Until then, happy baking! Preheat oven to 350°F. Spray a cookie sheet with nonstick cooking spray. In a large bowl whisk the flour, cocoa, baking powder, baking soda, and salt. In a separate large bowl beat the sugar and butter with an electric mixer at high speed until well blended. Beat in the vanilla and egg until blended. Mix in flour mixture and chocolate chips (and optional nuts) with a wooden spoon until just blended. Drop by tablespoonfuls (or use a small cookie scoop) two inches apart onto prepared cookie sheet. Bake 11-13 minutes or until puffed in the center (just barely set). Remove from oven; cool on pans 5 minutes. Remove from sheets and cool completely on wire racks. Makes 30 cookies. Nutrition per Serving (1 cookie):Calories 82; Fat 2.8g (sat 1.5g, mono 1.0g, poly 0.1g); Protein 1.1g; Cholesterol 12mg; Carbohydrate 12.6g; Sodium 56mg. I’m more of a salty gal myself. Give me french fries over ice cream any day. However, this post was intriguing. We always made our chocolate chip cookies w/ shortening rather than butter, so I’m used to the flavor. Oh, BTW, I made the spice cookies & they were delicious!! I screwed up a little, forgot the coriander (which I bought especially for the cookie, arrgh.) and mysteriously did not have honey (but had molasses instead, for yet another of your recipes) . . . but they still turned out really well, a testament to how essentially good that recipe is. Come to think of it, I’m pretty sure my mom’s choc. chip cookie recipe called for shortening, too. I’m not sure, I’ll have to ask her. It might have been 1/2 butter. Glad the spice cookies turned out! Hey there Katrin! You cheered me out of a mid-morning malaise yesterday with your post–thank you so much! I would be happy to post a lighter banana bread recipe and quick bread tips. I have to confess, though, that while I enjoy making banana bread, my husband has assumed almost 100% of the banana bread-making duties in our house. We always have lots of bananas, which means we have a regular cycle of brown bananas ready for bread, and for some reason (I think it has something to do with his abhorrence for fruit flies), he’s always whipping some up. As baking chance would have it, he made some last night. I’m going to steal his recipe because it is perfect (light on the oil, not too sweet, and half whole wheat flour). He has it in his head, but I’ll corner him for the recipe and post next week. I have always been afraid of anything “shortening,” because I had no idea what it was. This is great info! I love your picture here as well. Gorgeous colors and contrast. Hey, I found the chopped hazelnuts yat Kroger, as you mentioned–I am so thrilled to know they are so available and affordable now! Plus they were on sale, so I bought multiple bags for the freezer. Thank you! just stumbled across your blog… i love it. 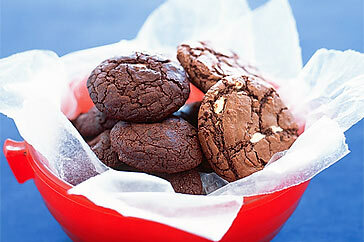 so i’m going to try these chocchoc cookies tomorrow, all shortening (friend’s baby has dairy AND soy allergy). i saw your post on basil choc cake and got to thinking… i’ve got a ton of fresh mint right now. SO, i minced 1 C packed mint with 1 C sugar. Here’s my question… would you suggest using 1 C mintysugar in this recipe, more or less to compendate for the mint? change any other ingredient amounts to compensate? i’ve never experimented with fresh herbs in cookies, so any thoughts you have would help. Thanks for this post! It’s wonderful! Thank you for this information! It was very helpful to me today! Thank you for this amazing experiment/port! I am currently working on a project on proving kitchen myths/advices, mine being ‘Using shortening makes cookies fluffier’. I was wondering what the meaning of ‘fluffier’ was in baking (since I don’t bake often) and if this advice was true. Just made these cookies with shortening (trans fat free) and they were very good. Thanks! So happy to have found you. I was searching for a red velvet cake recipe for my sons bday, one thing led to another and here I am. Just followed you on twitter too! Great resource, thanks! Thanks for confirming my suspicions — my mom and I use the same chocolate chip cookie recipe, but she substitutes shortening/margarine for the butter, and I use butter. Hers are moist and chewy, mine are flat, lacy-thin, and crispy once they cool. They have great flavor, but I miss the chewiness. Just got to the “stir with a wooden spoon” part and am wondering what you mean by “prepared” cookie sheet? Do I need to grease it? The cookie dough tastes pretty amazing–hope I can resist and have something left to bake! It’s referring to the cookie sheet that you’ve sprayed with cooking spray (it’s the first line of instructions, right after preheating the oven). I hear you about the cookie dough…oh, the quantities of raw cookie dough I have eaten! 🙂 Enjoy! Ah. I see it now. Thanks. In they go. While we’re on the topic, when would you use baking parchment when baking cookies? Holy Moley! Easily the best (munch munch) chocolate cookie (mmmm) I’ve ever tasted (crunch shmunch)..they’re for my Toastmasters meeting tonight so I made them teaspoon size to go further. And I have vegetarians lurking about so I used an egg replacer and went with the butter. Chocolate chips were the dark chocolate kind. I am moving on to your sugar cookie next and need a spice cookie, do you have one available? The archives are disabled..but I can wait and buy the book. Sold on one chocolate cookie! I was just debating whether to follow a cookie recipe as-is, with shortening, or to go with butter. Thanks for spelling out all the key differences so thoroughly! It’s a peanut butter toffee cookie…I can’t really decide whether softer texture should outweigh flavor in this, but since I’m involving toffee I do think I want the butter flavor to be in there. So I’m gonna go halfsies and see what happens. Thanks, Camilla! Great recipe. The cookies turned out perfectly (butter) and appeared just like yours. However, everyone at church said they are way tooooo sweeet!!! Next time I plan to cut the sugar in half. Thanks for posting! Thanks for your recipe! i made them this weekend and they were a huge hit with my family! My husband…who doesnt have much of a sweet tooth…loved them and requested not only that I make more this holiday season but also add it to our list of goodies we make each year! I just tried shortening in my frosting and it tastes great!! Thanks for the great information about substituting shortening for butter. My daughter has a problem with her digestive system and butter (or any other creamy/dairy) product just doesn’t work for her. I’m wondering if you added the 1 and 1/2 teaspoons water for every 1/4 cup of shortening in your comparison baking here, or if you just went with straight shortening? This was super helpful. I was out of butter but needed cookies for an event and using your tips about flavor opted to test my oatmeal cookies with shortening. So soft. This is so helpful to me! I can’t have any dairy products so I have stopped using them even when baking for the holidays for others. So I’m happy to see that you enjoyed the shortning cookies as much or more than the butter cookies! Thanks, thanks, thanks! This saves me from test baking for my cookie exchange party this year! This is great info for a person looking for a dairy free recipe. It’s hard to find things w/o butter in them. Knowing I can substitute shortening is good to know. I might repeat here because I don’t read comments. Nevertheless, you shared that Crisco has removed trans-fat, and I was skeptical, especially that Crisco declared itself “zero gram of trans fat”. I checked the ingredients and confirmed that it STILL has trans-fat. Anyway, it’s a progress they are making, and we can keep pushing them further. One thing I do know about shortenings with no trans fat is that the product breaks easily. I use to use a Club cracker for a bacon appetizer I did while catering. All of a sudden every other cracker was breaking before I even got the bacon wrapped around it. I contacted Keebler and they told me it was because the product now had no trans fat. Also, if you try making a buttercream frosting using shortening with no trans fat, the frosting will “break”.